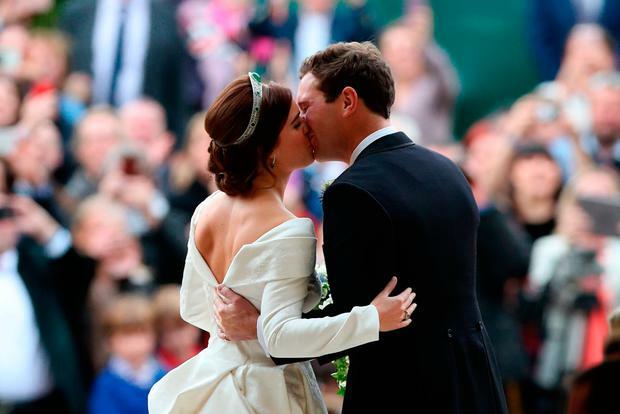 Eugenie opted for a beautiful ballgown style, created by British-based designers Peter Pilotto and Christopher De Vos, who are known for their innovative fabrics and glamorous designs. And hidden within those designs was a nod to the princess's heritage. The heavy jacquard fabric of the dress had several symbols woven into it, including a shamrock for Ireland as a nod to the bride’s Ferguson family. The design also contained a thistle for Scotland acknowledging the couple’s fondness for Balmoral, and the York Rose and ivy representing the couple’s home. The low neckline of the dress accentuated the bride's elegant emerald drop earrings, which were given to her as a wedding gift from her groom Jack. "During several fittings the dress was developed layer by layer, constructing it from the corset and the complex underskirt to the fitted bodice and full pleated skirt. "The dress features a neckline that folds around the shoulders to a low back that drapes into a flowing full length train. 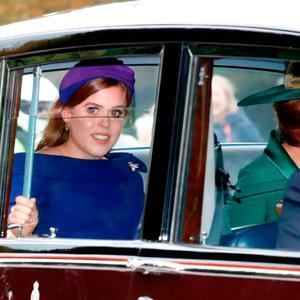 Eugenie opted not to wear a veil for the service, instead accenting her glamorous gown with her grandmother's tiara - the Greville Emerald Kokoshnik which consists of rose cut diamonds pave set in platinum, with six emeralds on either side. Her hair was styled by Sonny-Jo MacFarlane of Hari’s, with make-up by Hannah Martin of Bobbi Brown. Her sister Beatrice wore a chic two-piece number - a green off-the-shoulder peplum top and chic fit-and-flare skirt, with her mother Sarah opted for a fitted green dress and gilded boated hat.